In short, Far Cry 4 is Far Cry 3 in Nepal, or rather Kyrat, its fictional stand-in. You'll find far more that's similar to the previous game than different, so the clichï¿½d "if you loved the previous game, you'll love this one" certainly applies here. Our fish out of water protagonist who suddenly finds himself in the middle of an insurgency this time around is Ajay Ghale, who was born in Kyrat but raised in the US. Returning to Kyrat to deliver his mother's ashes to the place of her birth, Ajay soon learns that his father was the founder of the Golden Path insurgency that is battling against ruthless dictator Pagan Min. The Golden Path looks to Ajay to lead them to victory, but he just wants to honor his mother. That doesn't stop him from taking up arms against the government, though, and cutting a path of destruction to Kyrat's capital with the Golden Path right behind him. Story is probably Far Cry 4's weakest point. If the protagonist is almost indifferent to the Golden Path and their cause, it makes it hard for you to care that much either. Another problem is that the sheer magnitude of things that the game gives you to do means that the story missions are spread out and spread thin across the hours you'll spend with the game. Adding to this issue is the fact that there are a half dozen or so major characters that you'll interact with in the story, and it can be a long time between your interactions with them. Kyrat is a fascinating place so it's a bit of a disappointment that the story is so short on content and that content is spread as thin as the Himalayan air. While the story may be a bit thin, there's no shortage of things to do in Kyrat. Lifting the fog from the extensive map involves the capture of radio towers by climbing your way to their tops, an exercise that will be familiar to anyone who's played Far Cry 3 or an Assassin's Creed game. Loosening the government's grip on the surrounding territory requires the capture of its bases, which is one of the game's most enjoyable activities. You're free to choose how you want to take out the bases, just as long as you kill its entire garrison, and any reinforcements that may arrive should the garrison manage to raise an alarm. You can sneak around the base taking out everyone with a knife, toss in a few hunks of meat and let tigers do your work for you, make it rain RPG rounds, or come charging though the front gate on the back of an elephant. The variety of bases, AI smarts of the enemy, and the myriad of options that you have in attacking them make the base assaults a blast. And if you want a real challenge, Kyrat's ruling elite each have their own heavily defended fortresses. The massive walls and heavy defenses of the fortresses make them difficult to capture. The first time I came across one, I thought that I'd see if I could crash through the front gate on the back of an elephant. That's when I discovered that the fortresses are surrounded by minefields, as both my elephant and I went out with a quick bang twenty yards short of the gate. The game encourages you to take advantage of its co-op support for fortress assaults, as you can have a friend drop into your game to double your firepower. It is possible to take out a fortress on your own, but it definitely isn't easy. I was able to do it, but I got lucky at the end. I was out of ammunition and had scavenged everything I could find, and had a final standoff against a helicopter circling the fortress and strafing me with machine gun fire. I have to say it was one of my more memorable gaming moments when I finally downed the helicopter with a Molotov and the fortress fell to my one man assault. The quantity of side mission types and collectibles to find are too numerous to list here, but suffice it to say that the explorers, collectors, and completionists will find more than enough to keep themselves busy here for a long time. Of course each activity is not unique with each undertaking, so you'll be experiencing a fair amount of dï¿½jï¿½ vu once you've put six or eight hours into the game. Hunting is an important activity in the game, not just to obtain the meat you'll need to bait wild animals to attack your enemies, but also to obtain the pelts that you'll need for the game's crafting system. Your ability to carry more weapons, ammo, and loot are all tied to upgrades that are obtained through crafting, with the top tier item in each category requiring you to track down special unique animals. Hunting with RPGs and hand grenades works, but you'll ruin a lot of pelts that way so you'll need to get handy with a bow and arrow to hunt efficiently. Kyrat is a big world, and Far Cry 4 does a great job of making it feel alive. Traveling to a waypoint that you've set on the map is never a simple Point A to Point B journey, as you may encounter enemy patrols or convoys, random events like hostage situations or courier intercepts, or find your car taking a broadside from a rhino charge. That world is gorgeous, too, and scaling a cliff side to a high bluff or taking to the skies in a gyrocopter or a wingsuit will reward you with sweeping vistas of distant peaks and valleys blanketed in forests and lakes. 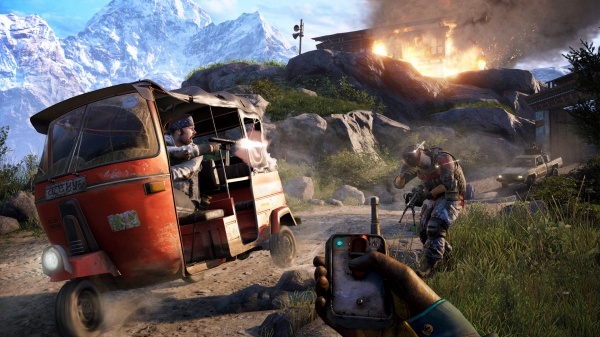 Far Cry 4 provides such an expansive single player experience that it's almost easy to forget that there's a competitive multiplayer side to the game. Multiplayer features five-on-five team-based play in three different modes. There are some interesting aspects to it, such as matches in which one team are armed only with bows (they can use explosive arrows, though) but are given a stealth ability, and there's a certain unique quality to playing on heavily forested and sloped maps. Overall, though, it's certainly treated as a secondary mode by the game, and I wouldn't recommend anyone buy the game with the intention of spending more time in multiplayer than in the campaign. The game's custom map editor is worth a mention, though, as players can create and share custom game levels designed to be played as single player challenges. There's some fun to be had here even if you're not the map-designing type, as the map editor lets gamers create some pretty crazy levels. Overall, I enjoyed my time with Far Cry 4, although it's really an extension of Far Cry 3 with a more exotic location but a weaker story. Open world shooter fans should enjoy their trip to Kyrat. Final Rating: 87%. 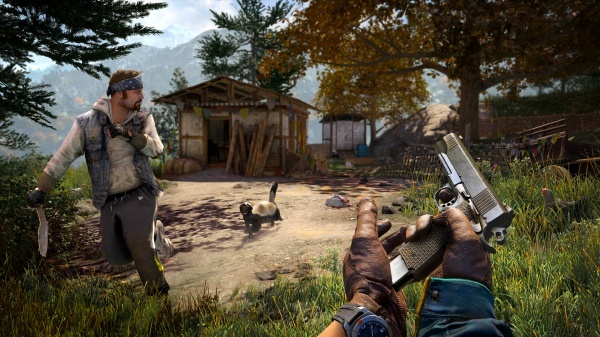 Far Cry 3 makes a move to the Himalayas.